Series 66 - Combined Securities Agent / Investment Adviser Rep.
**SIE or an applicable license is a co-requisite to take this exam. Learn more about the SIE exam. The Series 7 Top-Off examination is required for individuals who wish to sell all types of securities for FINRA member firms, and for FINRA "general securities" member firms. The exam consists of 125 multiple choice questions administered through computer using the "Proctor" system. Each SMART 7 Top-Off Program includes a "Listen" button that explains the information to the user, covering the material in a manner that enhances learning by giving context, background, and test application. Each "Listen" segment is unique and is not a repeat of our printed text. 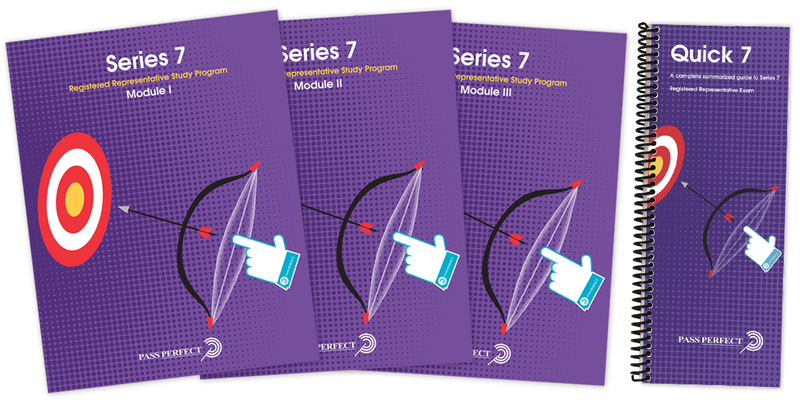 SMART 7 Top-Off Interactive Web Training is a complete self-study training package delivered online. The program has the full text of our printed materials, along with an extensive question pool. 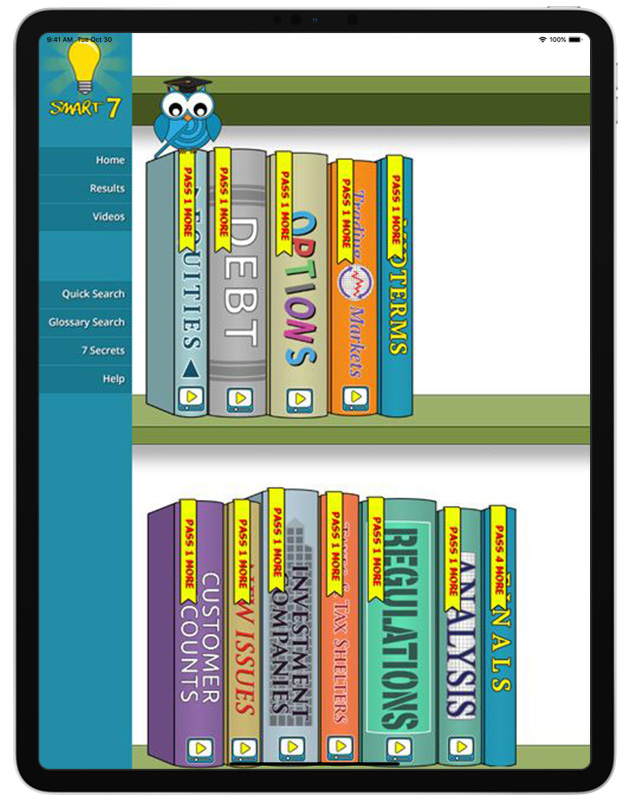 The program is divided into the same "Chapters" as our Series 7 Top-Off text, and includes an online textbook that leads the user sequentially through every topic, testing the user on each major point. Our SMART programs a proven success – each year thousands of individuals at major FINRA member brokerage firms have passed using SMART. Tailors the training experience to each user's strengths and weaknesses. The program dynamically modifies each student's learning sequence, based on the student's strengths and weaknesses. If a user is having difficulty with a major concept, he or she is presented with the information to be learned in a variety of reinforcing methods until mastery is achieved. Therefore, users who are not having problems move rapidly through the program; those that are having difficulty will move more slowly, but they will meet the minimum competency level needed to pass the examination upon successful completion of SMART 7 Top-Off. We developed this learning approach by combining the most successful teaching techniques culled from 30 years of preparing students for the securities exams. À La Carte Series 7 Top Off Printed Materials Only Available In Bundles * * Please Note: Printed Materials are only available when purchasing a bundle, this is to ensure that questions provided are always up-to-date. This fully illustrated 3 volume text is written in a lively, informative fashion that eliminates boredom. After each section (about every 10-20 pages), simulated test questions with detailed explanations give the user immediate feedback on his level of understanding. Also included in this set is a Quick Study Guide. By combining these written books with exams from our SMART program, there are no surprises when it is time to take the actual examination. PassPerfect Live Virtual Classes are designed for final review before an individual takes his or her licensing exam. These are web-delivered live interactive classes taught by seasoned instructors who know these exams. The classes are exam-focused, emphasizing the content that is most heavily tested and the content that is most difficult. The key to any live class is the instructor. Our instructors have, on average, been doing this for 30 years. This means that they really know these exams inside and out and they also know how to teach the content so that it comes alive in class. Our instructors really care about their students, and stay available after each class session to work with students who need extra help, and to answer additional questions on a one-on-one basis. A great class experience can make all the difference in being properly prepared for these difficult exams. Please note: Students should enroll in a virtual class after they have substantially completed their studies using their recently purchased Pass Perfect materials. To receive the full benefit from virtual review, class should be scheduled close to the actual test date. Need to take the exam again, and just want questions? Pass Perfect is a leading developer of targeted, effective training programs for Series 7 and other FINRA and NASAA securities licensing exams. Our level of experience and expertise is unmatched. Over the last 30 years we have successfully trained over 1,000,000 individuals for these exams.